Our goal at Magnum Contracting Group is to provide homeowners with the type of service that greatly improves the value and enjoyment of their homes. In order to be sure that you receive precisely the services you need, we work directly with you during the project. Our Centereach roofing and remodeling services are designed to ensure you have the highest level of craftsmanship no matter what type of repair or improvement project we are working on. We are professionally licensed and insured professional roofing and construction contractors. Regardless of the size or scope of the job, we'll make sure you have exactly what you need down to the smallest detail. Your home is a huge part of your life, and certainly one of the biggest investments you'll make, so we do all we can to make it into the home of your dreams. Every roof fails at some point, though there are many that last for decades longer than others. In our area of the country, the climate plays a huge role in how long the roofing systems last. With snow, ice, moisture, and ocean salt hammering our roofs, they need to be more durable than in other climates. If it's close to the time where your Centereach roof needs replacement, you will do well to consider a composite roof or metal roofing system. If repairs need to be made only, be sure you choose a quality-made roof shingle if you want it to last. 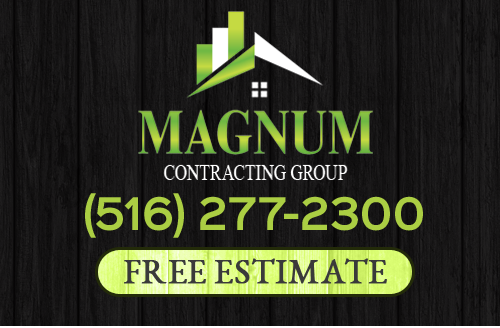 For all your roofing needs, you can count on Magnum Contracting Group where you get quality products and workmanship every time. Bathrooms should be a place of solitude and relaxation in your home. But often, thanks to faulty plumbing fixtures, lack of ventilation, or simply a poor use of space, the bathroom can be more of a source of frustration. Our expert Centereach remodeling contractors can work with you directly to create a bathroom that is a haven in your home. We can install new flooring, rearrange or repair the plumbing, replace light fixtures, move electrical outlets, or do anything else to transform your bathroom into a place you love. If you want to maintain the character and charm of an older style, we can help you modernize it while still keeping the style. Or, we can create an entirely new modern bathroom that suits your every need for luxury. Call and tell us what you have in mind for your old bathroom! If you need roofing or remodeling services in Centereach, NY, give Magnum Contracting Group a call today at 516-277-2300 or complete our online request form.